Congratulations to our #FundMyTrip winner Laurie Strebe! Learn a little bit more about her and how she will use her funding to live her dreams! Currently I am pursuing an Associate Degree in Dental Hygiene, all core classes have been taken and will start seeing real patients next semester. I also work in a Dental Office and assist as well as help out wherever needed. My career choice was decided after being introduced to the field by volunteering with a Dentist who cares for patients confined in a local nursing home. It was then I knew I could not only become a Hygienist but take it a step further and use my talents by helping those who needed me most! What do you plan on doing with the Fund My Trip Grant? 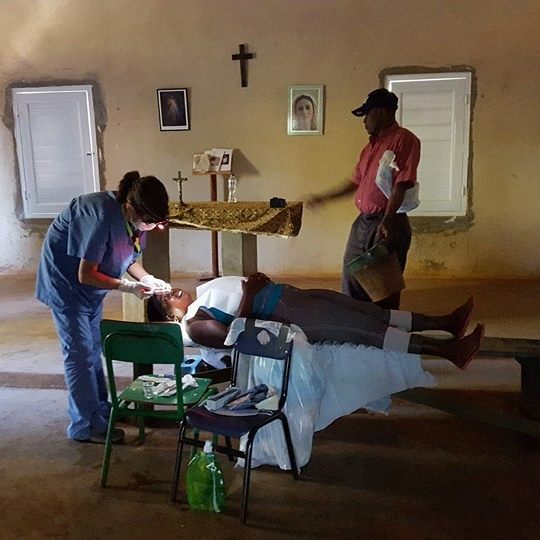 The Fund Trip Dream Challenge funding/grant is allowing me to join a group of 15 others on a Medical/Dental Mission to Elias Piña, DR. For 5 days our group will be traveling to remote villages located on the Dominican/Haiti border. We will see approximately 600 persons who normally would not have a chance for much needed care. This region is very poor and don’t even have funds or means to purchase aspirin for something as simple as a headache! My duties will include, but not limited to, providing fluoride treatments to children and adults teeth, oral hygiene education, and assisting the two Dentists with their efforts. My biggest accomplishment so far would have to include being recognized, nominated, and won a ‘Peers in the Profession’ award by an International Toothpaste company. The wall plaque with my name on it fuels my intense desire to do well in everything I set out to do. My biggest challenge I had to, and have to still overcome is my intense shyness. The best way to deal with shyness or anxiety is to throw yourself with 15 other strangers and spend time with them planning a mission trip! I pushed myself to do things I was not comfortable with to deal with my insecurities. I have learned we all feel unsure of ourselves at times so I always try to remember I am never alone. What has the ‘highlight’ of your journey been thus far? The highlight of my life’s journey has been providing Dental care to retired Catholic Nun’s both in office and out in the field at their homes. I laugh every time I think of an incident where a Nun sneezed. Of course I said “bless you,” then immediately wondered if I could say that! I was assured it was okay and have been blessed hundreds of times just being able to spend time with these sisters! My inspiration comes from my faith first, then shadowing other women who, through hard work, have become successful. Success, I have deduced from these women, does not come from how much money you make, or how fancy the car is you drive. Success is a feeling that inspires more success, it is fuel for your next pursuit! My piece of advice to other young girls: Never compare yourself with others. You have many years to live with yourself so you might as well start this minute to be happy in your own skin. Look in the mirror tonight before bed and be happy what you see, you are beautiful!